The first generation Firebirds had a characteristic Coke bottle styling. Unlike its cousin the Chevrolet Camaro, the Firebird's bumpers were integrated into the design of the front end. The Firebird's rear "slit" taillights were inspired by the Pontiac GTO. Both a two-door hardtop and a convertible were offered through the 1969 model year. Originally, the car was a "consolation prize" for Pontiac, who had wished to produce a two-seat sports car of its own design, based on the original Banshee concept car. However, GM feared such a vehicle would directly compete with Chevrolet's Corvette, and the decision was made to give Pontiac a piece of the "pony car" market by having them share the F-body platform with Chevrolet. The 1967 base model Firebird came equipped with the Chevrolet 230 cu in (3.8 L) SOHC inline-6, and a single-barrel carburetor, rated at 165 hp (123 kW). The next model, the Sprint, also had the Chevy inline-6 but with a four-barrel carburetor, developing 215 hp (160 kW). Most buyers opted for one of the V8 engines: the 326 cu in (5.3 L) with a two-barrel carburetor producing 250 hp (190 kW); the "H.O." (High Output) engine of the same displacement, but with a four-barrel carburetor and producing 285 hp (213 kW); or the 400 cu in (6.6 L) from the GTO with 325 hp (242 kW). All 1967–1968 400 CI engines had throttle restrictors installed that blocked the carburetor's second barrel from opening all the way. A "Ram Air" option was also available, providing functional hood scoops, higher flow heads with stronger valve springs, and a different camshaft. Power for the Ram Air package was the same as the conventional 400 H.O., but the engine peaked at a higher, 5,200RPMs. The 230 CID engines were subsequently replaced in 1968 by the Chevrolet 250 cu in (4.1 L) stroked 230 CI engines, the first developing an increased 175 hp (130 kW) using a single-barrel carburetor, and the other the same 215hp with a four-barrel carburetor. Also for the 1968 model, the 326 CID engine was replaced by the Pontiac 350 cu in (5.7 L) V-8, which actually displaced 355 cu in (5.8 L), and produced 265 hp (198 kW) with a two-barrel carburetor. An "H.O." version of the 350 CID with a revised cam was also offered starting in that year, which developed 320 hp (240 kW). Power output of the other engines was increased marginally. There was an additional Ram Air IV option for the 400 CID engine during 1969, complementing the Ram Air III; these generated 345 and 335 hp (257 and 250 kW) respectively. The 350 CID "H.O." engine was revised again with a different cam and cylinder heads resulting in 325 hp (242 kW). During 1969 a special 303 cu in (5.0 L) engine was designed for SCCA road racing applications that was not available in production cars. The styling difference from the 1967 to the 1968 model was the addition of Federally-mandated side marker lights: for the front of the car, the turn signals were made larger and extended to wrap around the front edges of the car, and on the rear, the Pontiac (V-shaped) Arrowhead logo was added to each side. The front door vent-windows were replaced with a single pane of glass and Astro Ventilation, a fresh-air-inlet system. The 1969 model received a major facelift with a new front end design but unlike its big brother the GTO, it did not have the Endura bumper. The instrument panel and steering wheel were revised. The ignition switch was moved from the dashboard to the steering column with the introduction of GM's new locking ignition switch/steering wheel. In March 1969, a $725 optional handling package called the "Trans Am Performance and Appearance Package", UPC "WS4", named after the Trans Am Series, was introduced. Of these first "Trans Ams", only 689 hardtops and eight convertibles were made. Due to engineering problems that delayed the introduction of the all-new 1970 Firebird beyond the usual fall debut, Pontiac continued production of 1969 model Firebirds into the early months of the 1970 model year (the other 1970 Pontiac models had been introduced on September 18, 1969). 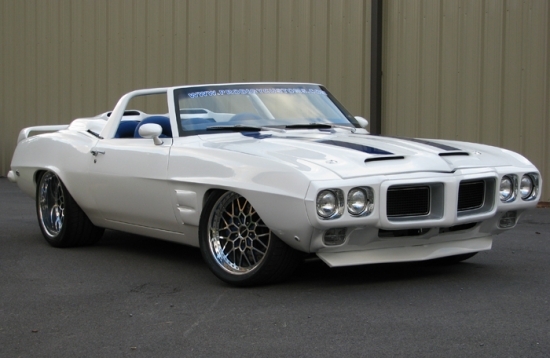 By late spring of 1969, Pontiac had deleted all model-year references on Firebird literature and promotional materials, anticipating the extended production run of the then-current 1969 models. The availability and cost of gasoline (two fuel crises had occurred by this time) meant the weight and the fuel consumption of the 3rd generation had to be considered in the design. In F-body development, both the third generation Firebird and Camaro were proposed as possible front wheel drive platforms, but the idea was scrapped. The state of the art of computerized engine management was in its infancy, and as long as saving fuel was the primary objective, it was not possible to have high horsepower and torque numbers. They did manage to cut enough weight from the design so that acceleration performance would be better than the 1981 models. They also succeeded in the fuel consumption department, offering a 4-cylinder Firebird that would provide 34 miles per gallon. GM executives decided that engineering effort would best be spent on aerodynamics and chassis development. They created a modern platform, so that when engine technology advanced, they would have a well-balanced package with acceleration, braking, handling, and aerodynamics. For the time being, they would have world class aerodynamics and handling, and excellent fuel economy. The Firebird and Camaro were completely redesigned for the 1982 model year, with the windshield slope set at 62 degrees, (about 3 degrees steeper than anything GM had ever tried before), and for the first time, a large, glass-dominated hatchback that required no metal structure to support it. Two concealed pop-up headlights, a first on the F-Body cars, were the primary characteristic that distinguished the 3rd Gen Firebird from both its Camaro sibling and its prior form (a styling characteristic carried into the 4th Gen's design). In addition to being about 500 pounds (230 kg) lighter than the previous 2nd Gen design, the 3rd Generation Firebird was the most aerodynamic product GM had ever released. Wind tunnels were used to form the new F-Body platform's shape, and Pontiac took full advantage of it. The aerodynamic developments extended to the finned aluminum wheels with smooth hubcaps and a functional rear spoiler. The second generation debut for the 1970 model year was delayed until February 26, 1970, because of tooling and engineering problems; thus, its popular designation as a 1970½ model, while leftover 1969s were listed in early Pontiac literature without a model-year identification. This generation of Firebirds were available in coupe form only; convertibles disappeared until 1991 after the 1969 model year. Macho Trans-Am (Package offered only by the dealership Mecham Pontiac in Glendale, AZ). Replacing the "Coke bottle" styling was a more "swoopy" body style, while still retaining some traditional elements. The top of the rear window line going almost straight down to the lip of the trunk lid, a look that was to epitomize F-body styling for the longest period during the Firebird's lifetime. The new design was initially characterized with a large C-pillar, until 1975 when the rear window was enlarged. 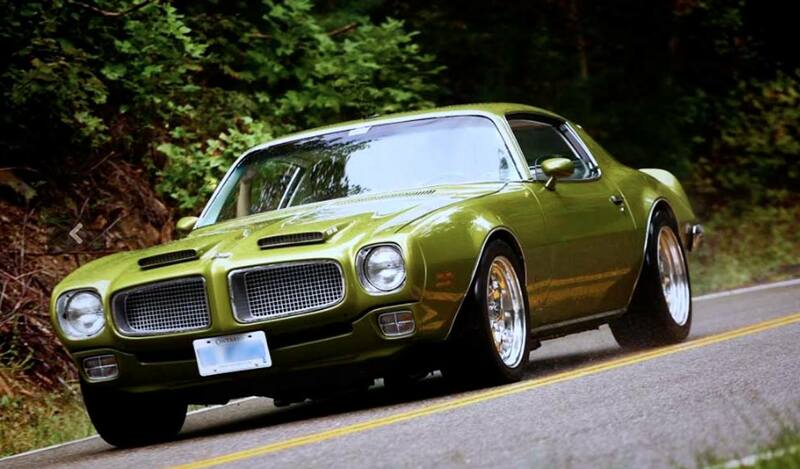 The fourth-generation Firebird amplified the aerodynamic styling initiated by the previous generation. While the live rear axle and floorpan aft of the front seats remained largely the same, ninety percent of the Firebird's parts were all-new. 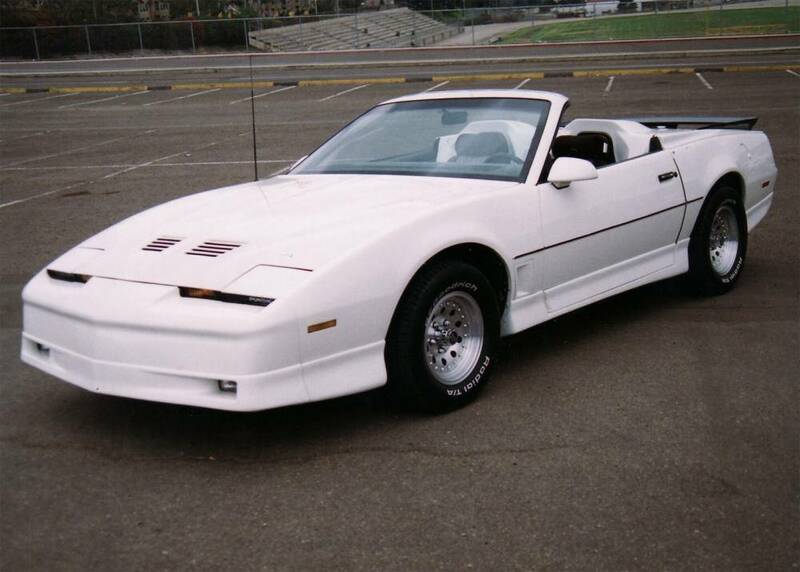 Overall, the styling of the Firebird more strongly reflected the Banshee IV concept car than the 1991 "facelift" did. As with the Camaro, major improvements included standard dual airbags, four-wheel anti-lock brakes, 16-inch wheels, rack-and-pinion power steering, short/long-arm front suspension, and several non-rusting composite body panels. Throughout its fourth generation, trim levels included V6-powered Firebird, and V8-powered Formula and Trans Am. The T5 five-speed manual transmission was standard with the V6s, as was the Borg-Warner T56 six-speed manual for the V8s. A four-speed automatic was optional for both, featuring built-in electronic controls beginning in 1994. From 1993 until 1995 (1995 non-California cars), Firebirds received a 160 hp (120 kW) 3.4 L V6, an enhanced version of the third-generation's 3.1 L V6. Beginning mid-year 1995 onward, a Series II 3.8 L V6 with 200 hp (150 kW) became the Firebird's sole engine. From 1993 to 1997, sole engine for the Formula and Trans Am was the 5.7 L LT1 V8, essentially identical to the LT1 in the C4 Corvette except for more flow-restrictive intake and exhaust systems. Steering wheel audio controls were included with optional uplevel cassette or compact disc stereo systems. Beginning with 1994 model year cars, "Delco 2001"-series stereo systems replaced the previous Delco units. :898 This revised series, also introduced for other Pontiac car lines, featured ergonomically-designed control panels with larger buttons and an optional seven-band graphic equalizer. 1994 also marked the first model year the fourth-generation convertible was available; every Firebird (and Camaro) convertible featured a glass rear window with a built-in electric defroster. The 1995 models were the same as those of previous years, but traction control (ASR: Acceleration Slip Regulation) was now available for LT1 Firebirds, controllable by a switch on the console. The steering wheel in all Firebirds was also changed; its optional built-in audio controls were more closely grouped on each side. The "Trans Am GT" trim level was dropped this year from the lineup after its model year run in 1994. For 1995, all Trans Ams received the 155-mph speedometer and Z-rated tires. 1995 was also the first year of the vented version of the Opti-Spark distributor on LT1 F-cars, addressing a common mechanical fault with the unit. The 'Transmission Perform' button was available only in the 1994 and 1995 Formula and Trans Am. This option was stopped for the 1996 and later models, but the connections remain for 1996 and 1997 Formula and Trans Am. While 1995 cars still used the OBD-I (On-Board Diagnostic) computer system (the last year of F-body to use OBD-I), a majority of them had OBD-II connector ports under the dash. Firebird performance levels improved for 1996, with the establishment of the stronger 200-hp 3.8 L V6 as the new base engine, and the power rating of the LT1 increased to 285 for 1996, due to its new dual catalytic-converter exhaust system. 1996 was also the first model year of the OBD-II computer system. Optional performance enhancements were available for each Firebird trim level; the Y87 Performance packages for V6s added mechanical features of the V8 setups, such as four-wheel disc brakes, faster-response steering, limited-slip rear differential, and dual tailpipes. :904 For Formulas and Trans Ams, functional dual-inlet "Ram Air" hoods returned as part of the WS6 performance package. The optional package boosted rated horsepower from 285 to 305, and torque from 325 lb·ft to 335. Also included were 17" x 9" wheels with 275/40ZR17 tires, suspension improvements, oval dual tailpipe tips, and a WS6 badge. Bilstein shocks were a further option with the package. 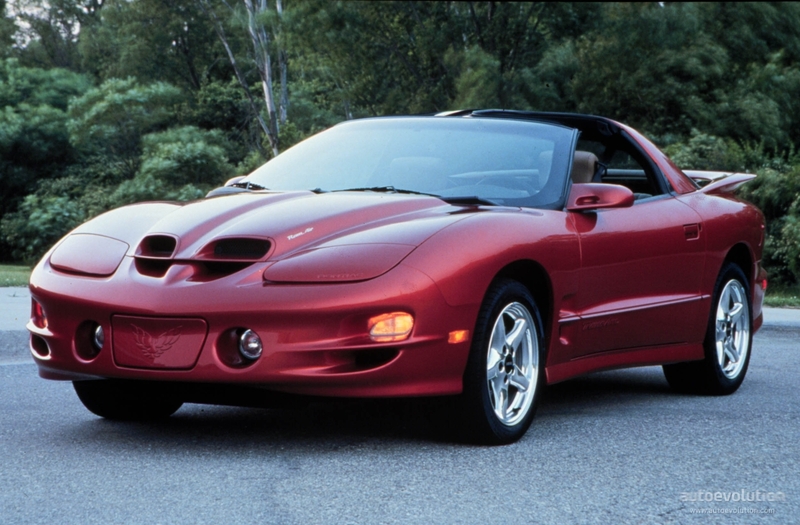 The 1997 model year introduced standard air conditioning, daytime running lamps (utilizing the front turn signal lamps), digital odometers, and optional 500-watt Monsoon cassette or compact disc stereo systems to all Firebird trim levels. :907 For V6 Firebirds, a W68 Sport Appearance Package was also introduced as a counterpart to the Camaro RS trim level. The WS6 "Ram Air" performance package was now also an option for the Formula and Trans Am convertibles, although these convertibles did not receive the 17-inch wheel-and-tire combination. There were 41 Formula convertibles and 463 Trans Am convertibles produced from 1996 to 1997 with the WS6 package.